Tata’s much-awaited compact SUV, the Nexon, launches this September. First impressions suggest the carmaker is onto something big. Given that Tata Motors was the one to realise ‘sub-four-metre car’ need not always mean hatchback (remember the Indigo CS compact sedan), it has taken its own sweet time to come up with a compact SUV. Sure, the carmaker had made its intent about breaking into the segment very clear with the Nexon concept of 2014, but it’s only in September 2017 that the final product will be available at a showroom near you. One look at the Nexon, though, and you’ll probably agree Tata Motors has used its time well to come up with a genuinely eye-catching rival to the likes of the Ford EcoSport and huge-selling Maruti Vitara Brezza. The Nexon is an attention magnet. Its overall design and styling are so radically different from what we’ve seen from Tata Motors, even over the past two years, that the badges are the only big giveaways of its company of manufacture. Tata’s compact SUV looks almost concept-car-like and actually makes the Maruti Brezza from 2016 look decidedly boxy and old-fashioned. The compact, rounded-off nose, the high-mounted headlights with ‘blisters’, the big wheel arches and the spot-on stance, give the Nexon a bold, confident look. The silhouette of the roofline, especially at the rear, is fairly conventional but the impression it delivers is that it is extremely low. The trick Tata’s design team have employed is to use a very aggressively dropping window line and a sharply rising belt line. The roof is in a contrast colour, and adding to the modern feel are the unique ceramic-like white highlights that underline the fog lights, run around the waist of the Nexon and then end in an ‘X’ at the rear. In fact, the pinched rear of the SUV, with its myriad surfaces, colours and complex forms, is actually the Nexon’s best angle. Getting all the panels and various elements to align perfectly has, however, been quite of a challenge, and this is visible in the C-pillar area where the interplay of multiple surfaces and materials don’t align quite perfectly. We are used to seeing interiors that are a big step up from Tata, especially on cars like the Tiago and the Hexa, and here on the Nexon, the carmaker has taken yet another little step up. The steering wheel and the instrument panel may have been carried over from the Tiago and Tigor, but the new central console with its gloss black and metallic finish and the layered dash create quite an impact. The dash is well finished, there are plenty of tastefully highlighted chrome bits, and the vents, glovebox release button and starter button are well integrated too. Material quality on the whole is good and the dash design is attractive, but the panel gaps are nowhere near as tight-fitting or consistent as those on some top German and Japanese cars. And there are some other odd bits, like the blank area between the air-con knobs, where you’d expect to see a temperature or blower speed display. The air-con settings, among other items, are displayed on the ‘floating’ screen at the top of the centre console. Tata says the screen’s high position minimises ‘eyes off the road time’ and it does display the essentials in clear sight. The 6.5-inch screen is a touch-unit and is superior to the one on the Tigor and Hexa in size and response, but it’s not the largest or most responsive by class standards. However, if you can get used to that little bit of lag in touch inputs, you will like the screen and user interface. The infotainment system does without onboard sat-nav but there’s Android Auto for navigation requirements. Apple CarPlay will be added soon, though Apple maps does not work in India. We missed having an integrated navigation system with on-board maps as in areas where there is no 3G or any network, Google maps tends to fumble. We should have downloaded the maps of our test drive route, which is one solution. We must mention 8 speaker Harman system which is simply outstanding and gives you a level of sound quality never seen (or heard) before in this class of car. There are plenty of well-executed, clever touches in the Nexon’s cabin. The massive cooled glovebox has recesses for holding cans, the front door pads have a smart holder for small folding umbrellas with channels to drain out water, and even the elbow box comes with a magnetic lid. There is plenty to speak of about the centre space between the seats as well. The offset-to-the-left (strangely) hand brake lever frees some amount of usable space, and Tata has used this space to create a storage area that runs all the way back to the elbow box. The sliding shutter that conceals this space is a real premium touch; the likes of which you’d expect to see in a Jaguar! Wish the flip-up cup holders inside were easier to operate though. Of the other things, some of the buttons on the dashboard are a bit small, while the rotary drive mode selector, borrowed from the Hexa, is too large for its limited purpose. The reverse camera could do with a few more pixels too, though the dynamic guidelines are handy. You sit at a nice height in the Nexon and the driver gets a good view out, but the thick A-pillar can be obtrusive at crossroads. The front seats are large and supportive for even tall drivers, but, unfortunately, the steering doesn’t adjust for reach. Thankfully, the footwell is wide and accommodating, and that’s not something you could say about the other models built on Tata’s X1 platform such as the Zest and Bolt. Tata had to altogether reposition the ducting for the climate control system to this end. While getting into the rear section of the Nexon’s cabin, you’ll find yourself lowering your head to avoid contact with the lowish roof, and once inside, the relatively small windows also don’t give the same sense of space as you get in a Brezza. Make no mistake though – the Nexon is properly roomy with ample legroom and surprisingly good headroom too. You could squeeze in three adults in the back but the defined seat contours make it rather clear this is basically a four-seater. Thigh support is excellent, with a long seat squab and you even get an air-con vent in the back, along with your own blower control, which is a first in this class. However, in a bid to create more headroom, the back rest is a bit too reclined, but still not uncomfortably so. As for luggage space, at 350 litres, the Nexon’s boot can hold quite a lot. The loading lip is a bit high but there is no shortage of space. The rear seats also split 60:40 and can be folded flat to free up as much as 690 litres of luggage space. Tata designers say that’s enough to hold a washing machine in its box; we wouldn’t disagree. The Nexon also comes with a Jaguar F-Pace-like smart activity band. With the wristband on, you can lock/unlock the vehicle and even start the engine, effectively doing away with the need to carry the key fob. Runners and swimmers will find the feature particularly useful. The Nexon will be offered with a new 1.5-litre, four-cylinder diesel engine and a 1.2-litre, three-cylinder petrol engine. Both engines come mated to class-first six-speed transmissions with power sent solely to the front wheels. Automated manual transmission (AMT)- equipped versions of the Nexon are under development and could be out by the year end. Tata’s new 1.5-litre direct injection turbo-diesel that also debuts on the Nexon puts out a healthy 110hp. A scaled-up, four-cylinder version of the Tiago’s 1.05-litre, three-cylinder diesel, the new engine fires easily with the first poke of the starter button. There is a bit of flutter at startup and some vibration is felt through the gear level but it settles down to a smooth idle. This motor is pretty refined even at higher revs and doesn’t make the same racket as the gravelly sounding 1.3 diesel in the Brezza. What’s immediately noticeable is how tractable the engine is; the Nexon pulls cleanly from as low as 1,400rpm. This tractability, due to the 260Nm of torque from 1,500rpm, makes driving in traffic quite easy and you don’t need to constantly downshift. Once you are past 2,000rpm, there’s a gentle wave of power and there’s no real spike like in the Brezza’s Fiat-sourced diesel. Post 4,000rpm, however, you hit a wall, and though the engine does rev to 4,500rpm, the drop in power at the top end is quite sudden. Unlike the Brezza’s unit which pulls well past 5,000rpm, the Nexon’s 1.5 diesel feels quite laboured at high revs. In fact, the lack of top-end punch and an average mid-range leaves you wanting for more power, even with the drive mode in the most aggressive ‘Sport’ setting. The Nexon’s high kerb weight of 1,305kg (110kg more than the Brezza) also blunts its performance to a great extent, and overall, we felt the Nexon could do with more punch. In a quick reference test, not done to our test standards, the Nexon managed to do the 0-100 run in 13.75sec, which is slower than the Brezza, at 12.9sec. The Nexon’s three driving modes, Eco, City and Sport, each with their own power and torque figures, distinctly alter the performance characteristics and have an impact on fuel efficiency as well. Sport mode, quite obviously, is the nicest to use, especially when extracting every ounce of performance but in the normal or City mode, performance is good enough for relaxed driving. In Eco mode, the Nexon feels particularly strangled and is only to be used if you’re running out of fuel or have exceeded your fuel allowance. 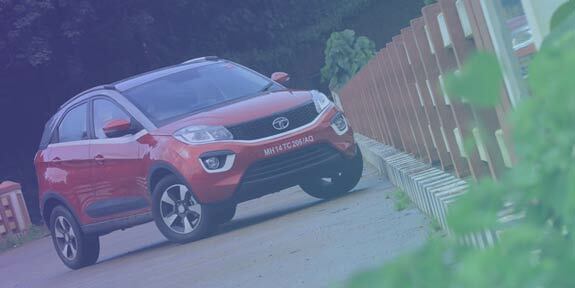 Tata’s all-new six-speed manual gives the Nexon an advantage over its rivals. One extra gear makes a big difference; it allows the Nexon to have a really tall cruising gear. In fact, the Nexon diesel cruises brilliantly. It can hold a steady 100kph with the engine turning over at a thoroughly relaxed 2,300pm. At these speeds, there’s little wind or road noise too, which keeps the occupants comfortably isolated from the outside. The clutch is pretty light, as is the short throw gearshift, but the gear lever needs a bit of a push every now and then between shifts. The Nexon’s petrol engine is a derivative of the unit that powers the Tiago and Tigor, and sees the addition of turbocharging and variable valve timing on the exhaust side too, as well as the inclusion of an integrated exhaust manifold. The engine’s internals have also been strengthened for the higher pressures and temperatures that are a result of the turbocharging, and fuelling has been recalibrated too. Power and torque figures are a healthy 110hp and 170Nm. The Ford EcoSport’s 1.0 direct injection, turbocharged EcoBoost petrol motor, for reference makes 125hp and 140Nm. First impressions of the Nexon’s petrol engine are positive. It’s fairly silent at idle and there are few of the vibrations you expect from a three-pot engine. But just as you get going, you’ll note some of the engine’s weaknesses. The bottom-end, for one, is quite meek. It takes time to get into its groove and what compounds matters is that initial power delivery is also a bit jerky. You can tell the fuelling is snappy (most so in Eco mode), as lifting off the throttle in low-speed environs is often accompanied by a jerk. Things settle down as revs build but this is not an engine that excites. The buildup of power is quite flat and there’s no real surge anywhere in the rev band. You’ll need to be above 3,000rpm to get the most out of the engine but with the limiter cutting in at 5,500rpm in Eco and City modes and 6,000rpm in ‘Sport’, the powerband is quite small. What is nice is that the engine isn’t loud at middle revs and even the typical three-cylinder thrum at high engine speeds is fairly well contained. Like the diesel Nexon, the petrol version’s six-speed gearbox isn’t the slickest around but you won’t really mind it unless you are really gunning it. The clutch is light too. We did, however, find gears three and above too tall for the power characteristics of the engine. As a result, drivability isn’t the best and you will find yourself reaching out for the gear lever as revs drop below 1,600rpm or so. The climb up the ghats to Idukki also highlighted the Nexon petrol’s lack of bottom-end poke, and on some steep hairpin turns we were even forced to drop down right to first gear. Where the Nexon scores top marks, however, is in the ride and handling department. Ride quality isn’t pillow-soft and you do feel some of the larger bumps, but the suspension rounds off sharp edges brilliantly. The little bit of stiffness in the suspension also means there is not much pitching or bobbing and body roll is well contained despite the Nexon’s height. There is a bit more up-down movement in the lighter petrol car, but on the whole ride quality is really impressive. The steering, borrowed from the Zest, is spot-on and one of the best electrically assisted units we’ve experienced in this class of car. It has a reassuring on-centre feel and weights up perfectly as you pile on the lock. All of this translates to brilliant overall stability, and with a best-in-class 209mm of ground clearance, and lots of wheel travel you really don’t need to slow down for potholes. The stiff chassis, impressive brakes and generous grip from the fat 215/60 R16 tyres give a lot of confidence through corners. It doesn’t feel as keen to drive as an EcoSport and isn’t as surefooted either, but work up a rhythm, keep the engines in their sweet spot and you’ll be nicely rewarded. If you are one of the many sold on the looks of the Nexon, you should be happy to know there is also genuine substance behind its style. Tata’s compact SUV is well equipped and made from expensive materials that make it look and feel more upmarket than its rivals, even if fit could be better at places. The needs of comfort and practicality are also abundantly addressed in the Nexon, ride comfort is really good and, as an added bonus, handling is excellent. Yes, the engines are not as exciting as their power numbers suggest but are adequate nonetheless. Fuel economy remains a question mark for the moment, but, as things stand, the Nexon is a fine package. Tata has also priced the Nexon aggressively, with prices starting at Rs 5.85 lakh (ex-showroom, Delhi) for the base petrol version and topping off at Rs 9.45 lakh for the top-spec diesel. All pointers suggest the Nexon could be Tata’s Swift moment – the car that changes its image for good. Tata Nexon :The car you’ve been waiting for? ..
Tata Zica Review by Awaaz Overdrive – CNBC A ..